The Schoolhouse at Mutianyu, located at the foot of the Great Wall of China, will participate in World Baijiu Day on August 8. 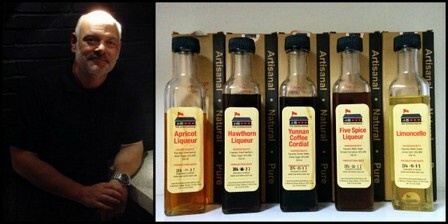 I interviewed Jim Spear, co-founder of The Schoolhouse, about the line of baijiu-inspired liqueurs the company produces. Boyce: You first came to Beijing in the 1980’s and have had your fair share of baijiu. What were your first experiences like? Spear: It all seemed to smell like kerosene and to be uniformly harsh. But after a few “ganbei” it started tasting great. I tried the infusions with lizards, snakes, mice, seahorses, various animal penises, and the like. But I was young, forgive me. My favorite was the liqueur made with baijiu and ants from Yunnan. It was supposed to be good for men. You’d have to ask my wife if she noticed any difference after I tossed most of a bottle with friends. I rather doubt it, of course, for as Shakespeare put it, liquor provoketh the desire but giveth the lie. The Schoolhouse makes five baijiu liqueurs, from apricot to coffee. How did that come about? We are developing a whole series of food and beverage products based on local and Chinese ingredients under The Schoolhouse brand. Taking the local erguotou to the next level with a variety of flavors was a natural. Our goal was to take the indigenous idea of “paojiu” and do it in a fusion style. I understand there was a great deal of experimentation. What were the biggest challenges in perfecting the formulas? All of our first five flavors were developed by Chris Cowell. What was difficult was making sure that after we developed a specific taste and aroma for each variety the recipe could be replicated and scaled up consistently. Making some flavored erguotou in a home kitchen is a lot of fun and can have great results. Producing a product reliably, from alcohol content, to color, to aroma, to taste, to sealing, to packaging, is a different challenge. We document every tiny detail of the process, from type of fruit (fresh, dried, whole, peeled, sliced, crushed, raw, roasted, brewed, and so on), how long and in what type of container the base spirit is exposed to the flavoring agent, the type of sweetening agent (if any) and when added and in what form, how much aging before bottling, and so on. But the initial process for each type is always a lot of fun, involving testing a variety of formulations and conducting tastings and implementing course corrections. Our product development center is like a chemistry lab. What has been the response to the liqueurs and what is the favorite? All we have is anecdotal data about how different consumers respond to our liqueurs. We’ve found many Chinese customers who really like the idea. The five spice flavor seems to be a hit with health-conscious people. The hawthorn flavor is most-liked by people who prefer something less sweet. We’ve had a professional limoncello maker from Sorrento, after initial skepticism, rave about our fusion version. If someone wants to try making liqueurs at home, what advice would you give him or her? Use inexpensive spirits for the base. Don’t go by received wisdom or necessarily try to replicate the flavor of a commercially sold or branded liqueur. Be creative! Anything you can’t drink, go ahead and use to clean the drain! Note: Look for some liqueur sampling and a lineup of specialty cocktails at The Schoolhouse during World Baijiu Day. More details to come. You can also check out these notes from a recent tasting of all five liqueurs. Previous Article← News | CBS: Can Baijiu Capture Hearts in San Francisco?